Remember when neon was trending last year and hologram was so hot not too long ago? I never really got into either. Black and white, on the other hand, is here to stay. This classic combo is something I will never get tired of. I love this vintage blouse from Waisted Vintage, the lace is just so beautiful and feminine. 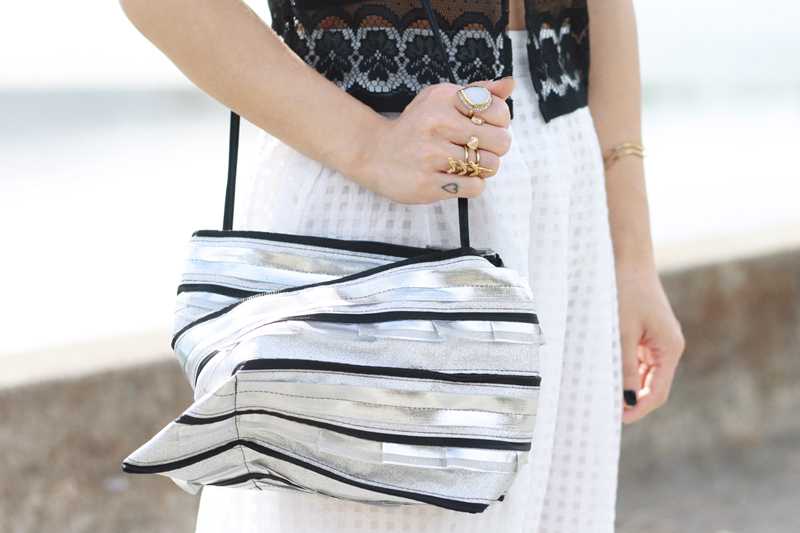 I paired it with an organza midi skirt with grid pattern, strappy flats, cat eye sunglasses, and this awesome silver purse from Kao Pao Shu. I love its unusual shape and if you look closely you can see the amazing pleated details too! Vintage sheer lace blouse c/o Waisted Vintage. White organza midi skirt c/o Choies. Silver Foxi bag c/o Kao Pao Shu. Strappy flats from Hong Kong. Cat eye sunglasses c/o Sunglass Warehouse. Triple sharktooth ring from Luv Aj. Gold marble pear shape ring by Blossom Box c/o G&W Jewelry. Girl, you know I love a good B&W look. Lovely top! Love this look, your patterns are lovely! I saw ur outfit on lookbook and it is simply irresistible! i love your style! I like the mix of elegance and sexyness here. Those ultra-strappy mary janes are perfect. This black and white ensemble is so chic! Your blouse is gorgeous! I never really got into neon either and I love how timeless the classics can be!